Cassiopeia the Queen is one of the easiest-to-recognize constellations, having the shape of an M or W, Schedar is the Queen’s brightest star. 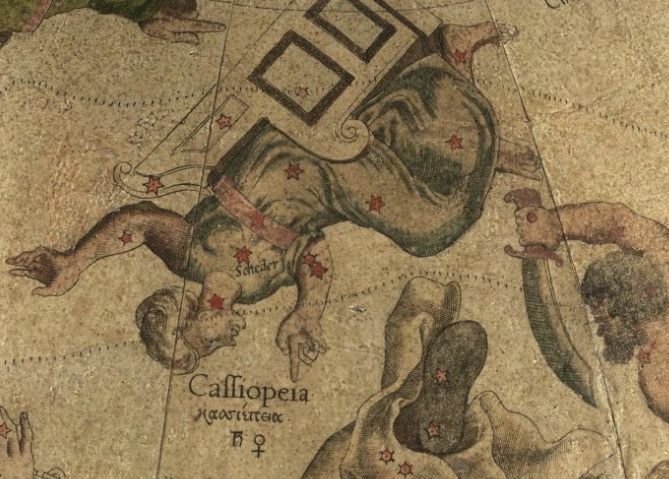 Cassiopeia constellation via the Mercator globes at the Harvard Map Collection via Wikimedia Commons. On star maps, the Queen is often depicted as hanging upside down, in punishment for her vanity. 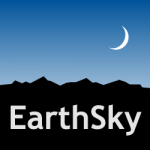 EarthSky tees are back! A percentage of the proceeds donated to selected causes. Are you familiar with the constellation Cassiopeia the Queen? If so, then you know it is one of the easiest-to-recognize constellations, having the shape of an M or W, depending on the time of night, time of year, and your perspective. The alpha star of Cassiopeia is called Schedar. This star marks either the righthand vertex of the W – or the lefthand vertex of the M – in this well known star pattern. Follow the links below to learn more about Schedar aka Alpha Cassiopeiae. Schedar in the lore of the sky. As the brightest star in the constellation Cassiopeia the Queen, Alpha Cassiopeiae doesn’t have any fantastic stories behind it. But, like all stars, it has its own interesting history. The star’s name, Schedar, derives from the Arabic word for breast. On old star maps, such as the one above drawn by the Flemish cartographer Gerardus Mercator in 1551, Schedar or Alpha Cass is depicted as being near the heart of the celestial queen. On this globe, he represents Cassiopeia as the Queen of Ethiopia, whose vanity was legendary. As punishment, it’s said, she is chained to a chair and hangs upside-down. Cassiopeia is one of the easiest constellations to find, if you are in the Northern Hemisphere. Its stars are relatively bright and make the shape of an M or W.
How to find Schedar. And indeed the sky bears out the upside-down-ness of Cassiopeia the Queen – some of the time. From mid-northern latitudes, Cassiopeia is circumpolar, meaning that it circles endlessly around the north celestial pole, never (or rarely, depending on your latitude) dipping below your horizon. 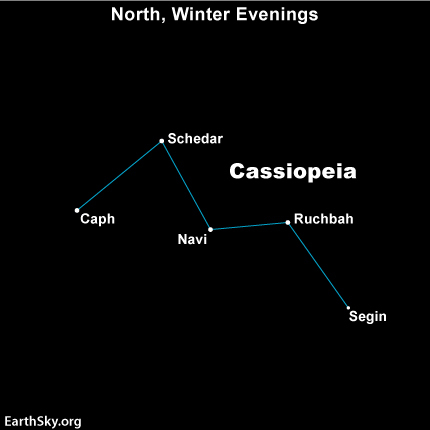 The Northern Hemisphere autumn months are a good time to see Cassiopeia and its brightest star Schedar, or Alpha Cass. That is when the constellation rides highest in the sky during the evening hours. Alpha Cass, or Schedar, is an orange giant star. Science of Schedar. The star Schedar lies about 230 light-years away and shines steadily at magnitude 2.2. 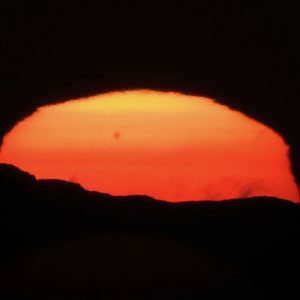 Despite skywatchers a couple of centuries ago suggesting that the star varied in brightness, modern astronomers have discerned no fluctuations. The star is about five times the mass of our sun, but it is cooler. 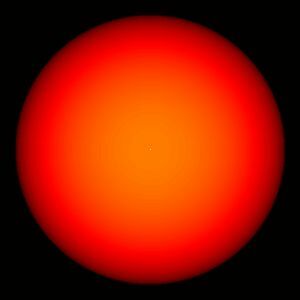 It is an orange giant star, and, like all giants, it rotates slowly on its axis. It’s believed that Schedar takes approximately 102 days to rotate once, in contrast to about 25 days for our sun. Schedar also has three stellar companions, all of which are too close to the star to be easily seen. Although these three stars have been listed with Alpha Cass in the Washington Double Star Catalog, it now appears that all of them may be unrelated and only lie near Alpha Cass along our line of sight from Earth.